It’s been a busy week of packing and shipping two encaustic monotypes and sending them off to their next show. “Break of Day” is headed to Petoskey, Michigan for the 2016 Fine Arts Exhibition at the Crooked Tree Arts Center. It takes a lot of time to package up the work for shipping, including shooing my feline studio assistant Jeffrey out of the box. Nevertheless I find it immensely gratifying to send these pieces out into the world to be viewed by a larger audience. Halsted. Instead of a traditional gallery, the spaces are called ‘Show Pods’ and are small store fronts that allow the artwork to be seen 24/7. The show “Dots” is the work of 14 artist members of FUSEDChicago. Much of my work, encaustic monotypes on paper, is subtle and intimate. So my challenge was to work in encaustic on board, creating a bolder look that would show well in these illuminated windows. To begin, I started with what I call ‘creation soup’. I use a tray and put paper or board down first. Then I use various papers (lots of circles like coffee filters in this case) and pour watercolor, ink or dye through the papers to create patterns on the papers and boards. Instead of letting all of that luscious dye go to waste, I add layers of dry silk and other papers on top to soak up the excess. This gives me a color coordinated stash of fabric and papers to create my mixed media encaustic work. Here is a quick photo of the tray as it is drying. The hardest part is leaving everything alone so that the wonderful patterns dry into the fabric and paper. I created my first video to show you the layers as I pull apart the dried papers and fabric. And here are two of the final encaustic paintings utilizing the colored silk for background and the coffee filters as ‘dots’. I’ve been taking online classes for a number of years with Alyson Stanfield(ArtBizCoach.com) about the business of art. She wrote the book ‘I’d Rather Be in the Studio’, which got me started following her blog and taking her classes. Well, in 2014 I took it up a notch and got involved in her Inner Circle coaching group. In addition to the awesome business information and coaching, I am delighted and inspired by the wonderful network of artists that I am now a part of. The two (so far) workshops that I’ve attended in Golden, Colorado, have given me the opportunity to meet and get to know incredible artists from all over the country and the world. Each time I have come home with a fist full of gorgeous business cards and new, dear friends. Stepping out of the isolation of the studio and sharing the ideas and motivations of other artists is enriching, and sends me back to the studio with new energy. One of the things I was blessed to share with other artists at the workshops was my little meditative pencil drawings-I call them Pencil Prayers. I intend healing energy as I meditate and draw them, and then share them freely with all who choose to pick one out. The Pencil Prayers all have their own energy, and it is great fun to see how everyone finds the one that is meant for them. This also opens the conversation about everyone’s individual art practice. It felt like everyone, in their own way, sent their energy out into the world in their work. So of course, I had to order a coffee mug! You get to choose a totem and a color for the inside, and then you wait………while she creates it just for you. Raven was my first choice, and of course blue for the inside. Now, when I sit down to draw my Pencil Prayers and have my cup of coffee, it comes with a little magic! Carolyn, I think I can hear your heart singing! Studio time, of late, has been unfocused and scattered. The time has come to clean up and refocus! Cleaning up, however, has involved pulling everything out to reorganize and declutter. It’s the chaos before the clean. Meanwhile, my new studio assistant,Jeffrey, is avoiding the whole clean up thing. Adventures in White: The cold, drifting kind. In November 2012, after 30 years in Indianapolis, IN, I moved my studio (and my life) to the lovely lakeside town of Watervliet, in Southwest Michigan. While living on Paw Paw Lake is beautiful, it doesn’t have the artistic community that I had spent so many years developing and nurturing in Indy. That doesn’t mean that the connections are not here, but they are more spread out geographically. Luckily, I love to drive! I’ve been an active member of the Women’s Caucus for Art (WCA) for a number of years, and the Indiana chapter is centered in South Bend, IN, just an hour’s drive south of my home in Michigan. I’m also a member of the Michigan chapter of the WCA, so I was excited when I got notice of a meeting in Ann Arbor, MI. The winter weather has been mild this year, so I made plans to drive the 2 hours there and 2 hours back to meet the members and get involved. As I’m learning here in SW Michigan, anything goes with the weather, and the day of the meeting was sandwiched between two severe winter weather watches. I managed to make the trip with some white knuckle driving, but not too much snow actually falling on the roadways. I’m really glad I went! It’s always exciting to be back in Ann Arbor (I lived there for 9 years and went to art school at the University of Michigan) and the town has an energy all it’s own. The chapter president hosted us in her studio, and we were able to share our work and hear about the activities of the chapter and members. One exciting project is a call to participate in “Women Yes!” a poster competition and campaign to bring art by talented women artists into the AAATA Buses in Ann Arbor, Dexter, Saline, Milan and Ypsilanti. I was able to share a small encaustic on panel, as well as the photo of my encaustic monotype that was published in the ‘Still Point Arts Quarterly’, announcing my ‘Best of Show Award’ for their online show in May of 2015. It was a good trip for connections. This Friday there is an art opening at the Box Factory for the Arts in St. Joseph, MI, and one of the former Michigan chapter members, Kei Constantinov will be opening a show there. St. Joseph is a mere 16 miles away, so I’ll be able to meet her and support a fellow WCA artist! Welcome to the unveiling of my new creative home-Blue Circle Arts. 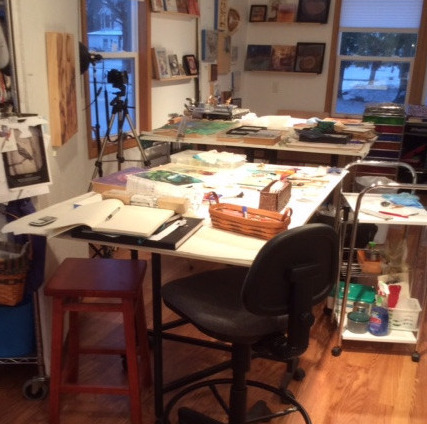 When my husband Steve and I made plans to retire to Michigan, we realized that my studio needs had outgrown the small cottage across the street from my house that I had purchased a few years before. With computer plans in hand, and a willing contractor,my quaint little cottage evolved into a large and spacious studio. The last time I actually named a studio, I called it Winged Arts Studio. So why Blue Circle Arts? I still have an incredible affinity for birds-even more so now, although that is a story for another time. Steve’s retirement dream was the 6 acres behind the studio that became his tree farm, which he named Blue Circle Farm. And it seemed fitting, given his gift of time and craft towards the creation of my space, that I circle in partnership. You can check out his blog here. If you’re looking for me, chances are I’m here-creating art, watching the birds and wildlife, writing, or walking the labyrinth under the pine tree. For me, this is a season of many transitions. In a year, my husband of 40 years will retire, taking us to the Michigan home that we have been living in part time for 5 years. Moving focus from the city to lakeside living is transition enough. Artistically, I am wondering if my 'voice' is changing. Let me elaborate. While I call myself a mixed media artist, printmaking has been a major focus. Then, about 20 years ago, I felt I found my voice in fiber. I still saw the stitch as line, and loved the dimensional aspects of stitched fiber-although printmaking certainly can have it's dimensional aspects. Now I have moved into encaustics-layers of wax on board, and carve-able like printmaking. And then comes fiber into the wax. 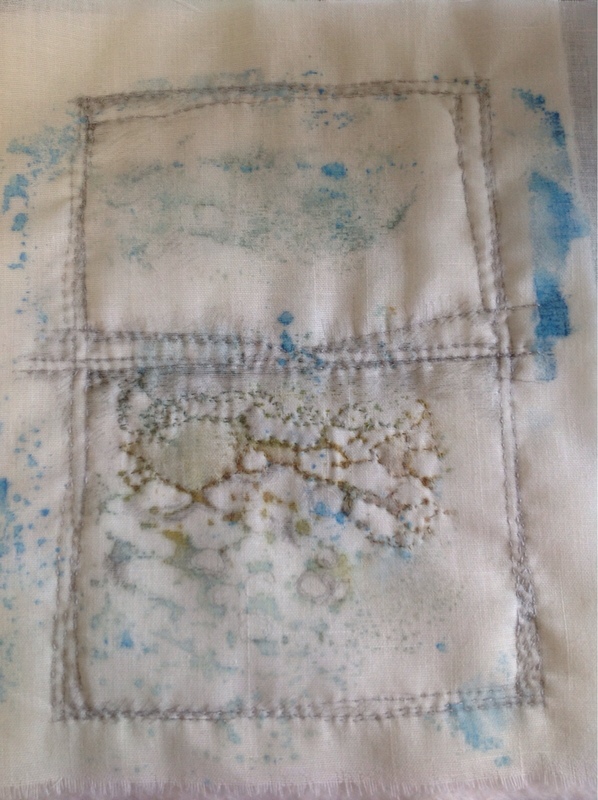 And again, in some cases stiching, like this encaustic monotype on fabric. So….maybe my voice isn't really changing. Maybe it's just getting deeper and more resonante.